ICSH. Recommendations for reference method for haemoglobinometry in human blood（ICSH Standard 1995）, J Clin Pathol. 49. 271-274. 1996. NCCLS. Reference and selecyted procedures for the quantitative deter mination of hemoglobin in blood. H15-A3. 2000. ICSH. Recommendation for reference method for the packed cell volume（ICSH Standard 2001）, Lab Hematol. 7. 148-170.2001. NCCLS. Procedure for determining packed cell volume by the micro hemato crit method, approved standard-3rd edition. H7-A3.2000. シングルチャンネル電気抵抗法 ICSH. Reference method for the enumeration of erythrocytes and leukocytes. Clin Lab Haem. 16. 131-138.1994. Recommended methods for the visual determination of white cell and platelet counts. WHO LAB. 1988；88：1. ICSH. Platelet cunting by the RBC/Platelet Ratio method, a reference method. Am J Clin Pathol. 115. 460-464. 2001. Miller disc method ICSH/NCCLS. Method for Reticulocyte Counting（Flow Cytometry and Supr avit al Dyes）；Approved Guideline H44-A. 1997. 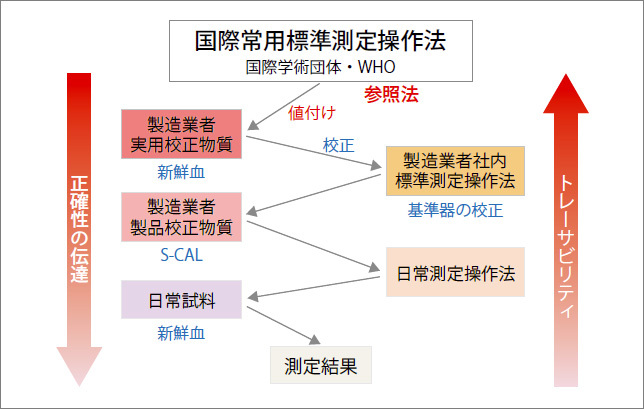 自動白血球分類 目視法 NCCLS. Reference Leukocyte Diff erential Count（Proportional）and Evalua tion of Instrumental Methods. H20-A. 1992.